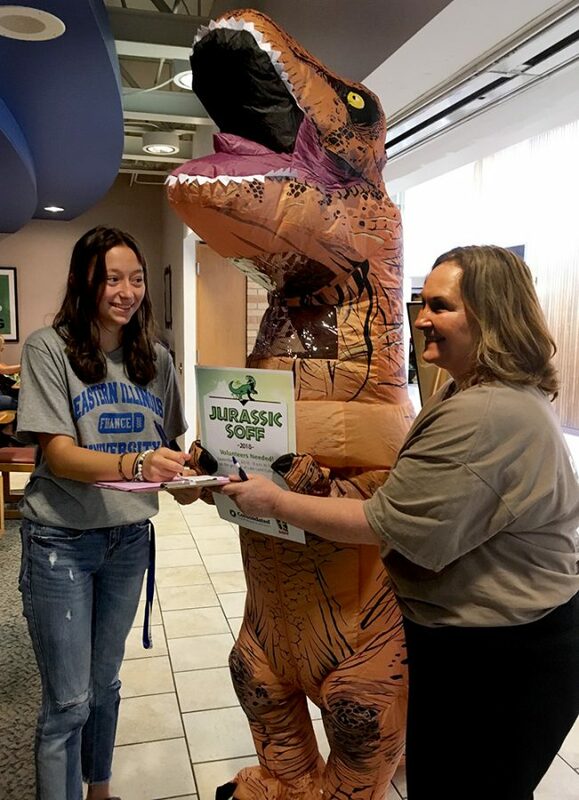 Kayla Jandek, a freshman finance major, speaks to Laura Diltz and Elizabeth Stark about the special olympics event JURASSIC SOFF at Lakeland College on Saturday, September 15. 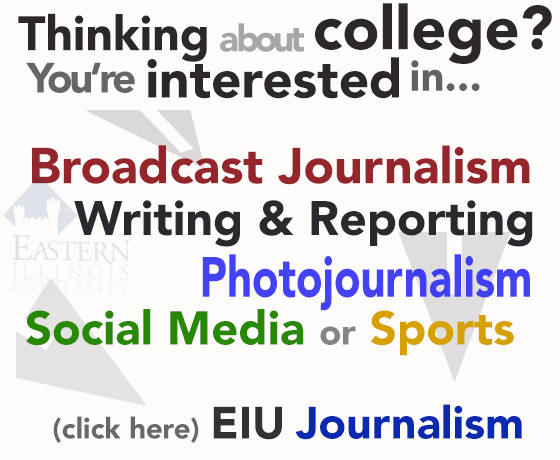 “We cannot do this event without Eastern Illinois University volunteers,” Diltz said. The Office of Civic Engagement and Volunteerism at Eastern hosted the Volunteer Fair and Business Expo Wednesday in the Martin Luther King Jr. Union Ballroom. The fair showcased a number of volunteer groups and local businesses and attendees learned about what products and services local business offer and how they can get involved with local volunteer groups. Annie Garner, a graduate assistant in the office, said there are dozens of great volunteer programs at the event that are looking for more helpers and many of them are available for online registration at VolunteerNow. Students can register to volunteer at both www.eiu.edu/volunteer and the PantherLife app, she said. While Eastern provides transportation for a majority of volunteer events, there are some it cannot, such as events that take place on Saturdays or during the evening, Garner said. All locations and addresses to events that Eastern does not drive volunteers at are online, she said. Paradise Equestrian Therapy Center, was one of the volunteer programs at the event. Penny Allen, executive director and supervisor of P.E.T., said the program is great for students studying special education, people with special needs or anyone interested in learning how to ride and take care of a horse. 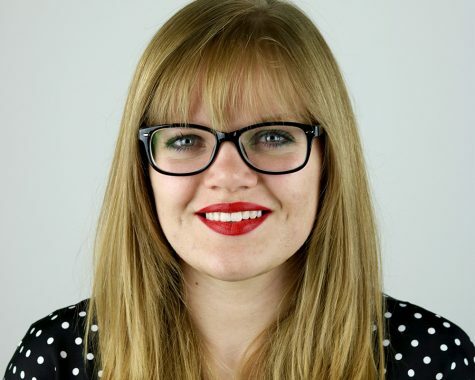 P.E.T.’s times and days of operation are Tuesdays and Thursdays from 4:30 p.m. until 7:30 p.m.
“This one time an entire fraternity team came over and it was hilarious watching (the) guys braid and brush the hair of the horses,” she said. Allen said volunteer work is an experience employers love to see that their potential employees have and said it looks great on resumes. Volunteer for P.E.T. Gale Poteete said she recommends volunteer work to anyone who has not tried it yet. For students interested in working with children and senior citizens, Fit-2-Serve is a great volunteer organization, said Founder Bill Duey. He said there are two volunteering programs. The first program is called Farm-2-Table and it focuses on helping first graders from Williams and Riddle Elementary Schools grow their own food, he said. The second program is Generation-2-Generation and it involves developing relationships and new friendships between elementary students and older generations living at senior living facilities through fun activities and mentored visits, he said. For Farm-2-Table, volunteers come in for one hour each month and choose from the three Fridays and one Thursday of the month for class, Duey said. For Generation-2-Generation, volunteers come in for one hour a month as well, and classes are available Monday through Thursday from 8:45 to 9:45 a.m., he said. “(Fit-2-Serve) is particularly great for Education majors because they work with children from public schools,” Duey said. Volunteer Coordinator JoEllen Hickenbottom said the program only requires one hour per month from volunteers. Duey recommends volunteer work to everyone because it is an unforgettable learning experience. “(Being) a pastor for 24 years, I’ve seen the beauty of volunteer work,” he said. Co-Owners Lauren Calandrilla and Jess Sweitzer said their volunteer program, First Fruits Homestead, involves operating a farm with produce to grow and harvest and livestock to care for. “(Volunteers) help us with anything we need done, (such as) weeding, seeding, helping us get set up for festivals, washing windows on greenhouses and general cleanup,” Calandrilla said. Calandrilla and Sweitzer call themselves “farmhers” instead of farmers to defy gender stereotypes about farming. For anyone interested in helping with farm animals, Calandrilla said First Fruits Homestead is a great group to volunteer for. Logan Raschke can be reached at 518-2812 or at [email protected].